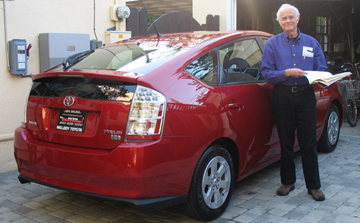 In Spring 2005 we replaced our 12-year-old Toyota Corolla 4-door sedan with a 4-door Toyota Prius. (B) simplicity to drive, beginning with the starter and shifting controls. (B) back drop-down seats making space to transport large items or to sleep. 3. It's turning radius is especially small, allowing for navigating in restricted spaces. Picture a miniature dachshund follwing its tail. 4. The car is a living teacher. The dynamic screen in the dashboard's center illustrates how much energy is being used every moment of a trip. So we're constantly improving our driving practices for using the least fuel. 5. The Prius is a travelling exhibit -- a portable visual aid and model that doubling or tripling energy efficiency can also be accompanied with comfort, spaciousness, and beauty. People in parking lots frequesntly notice it and ask about it. 6. We are still learning about fuel efficiency. (A) We live on a hill, which seems to mean greater fuel consumption. The energy going up a hill is not compensated for by downhill coasting. 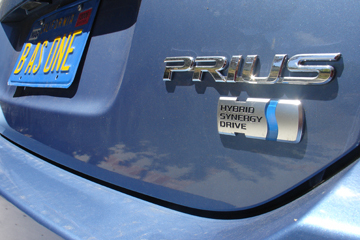 (B) With the Prius, the first ten minutes of driving uses more energy for engine warmup. So, many short trips need to be replaced with fewer longer tips to take care of needs in town. (C) We got 54 m.p.g on long, level, local freeway trips at modest speeds. We suspect we could do better at 55 or 50 m.p.h. (D) It's more like 41 mpg on shorter trips near home, among steep hills. That's still twice the efficiency of our old car.